If you like eating ice cream, you probably go out and buy it on a regular basis. Instead of hoping for a weekly sale for your favorite flavor, you can make whatever flavor you want using an ice cream maker. These ice cream maker reviews will help guide you in the right direction to find one for your budget. You wont have to spend so much time in the dessert aisle at the grocery store anymore. If you are like most people in the world, you probably like putting all of the fixings on your ice cream. None of the ice cream maker reviews mention the sprinkles or an ice cream cone. 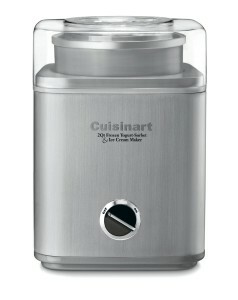 This Cuisinart ICE-45 is different from all of the other ice cream makers in a few ways. The first difference is the fact that it produces soft serve ice cream instead of a bowl of ice cream. You put your ingredients into the ice cream maker and let it churn for a little while. The double insulated freezer bowl makes the process go along a little faster. You then pull down on a lever and have soft serve ice cream of your favorite flavor in your own kitchen. This is great because you no longer have to strain your wrist trying to scoop out multiple scoops into a bowl. Another great feature is there is a cone holder on the side. You can grab your favorite type of cone, put it under the spout and let the soft serve ice cream flow endlessly into your cone. There are also 3 built in condiment dispenser. This means you can have your sprinkles, chocolate chips and even some peanuts on top of your ice cream cone without having to get everything out separately. This is a one stop shop ice cream maker. It produces 1.5 quarts in 20 minutes without any salt, chemicals or even ice. It is also available in 2 different colors, pink and white. Cuisinart makes some of the best kitchen appliances on the market. Their ice cream maker is no exception. These ice cream maker reviews showcase the best of the best and what features they have to offer. If you don’t mind spending the extra money, you will definitely get your bang for your buck. 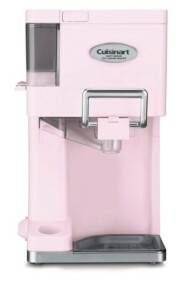 This ice cream maker in particular is completely automatic and can make frozen yogurt, sorbet and ice cream. This is like having 3 machines in 1! To give this appliance a more sophisticated look, they made the outside out of a brushed stainless steel material. To make sure it will last a while they put in a very durable and heavy duty motor. Some of the other ice cream maker reviews show a small ingredient spout. This makes it very hard to put the ingredients you desire into your ice cream. This one has a very large ingredient spout. You can add your favorite fruits and mix-ins with ease now. The freezer bowl is 2 quarts in size and is double-insulated. This ensures your ice cream will freeze to the perfect temperature to prevent any freezer burn or melted cream. You will also get a recipe book to help you find a new favorite flavor. If you are having trouble using this appliance you can turn to the instruction book that is also included. For roughly $80 and free shipping you can make as much ice cream, frozen yogurt and sorbet as your heart desires without having to go to the store every week. 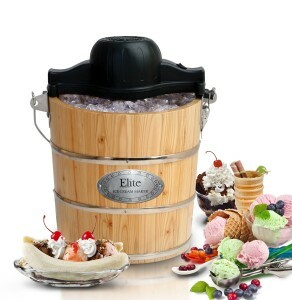 If you don’t want a boring silver ice cream maker, this Maxi-Matic Elite one would be perfect for you. This belongs on the ice cream maker reviews list because it has an old fashioned feel to it. This will be fun for the entire family to use. It is built to resemble an old fashioned pine bucket used to churn butter back in the day. It can be used manually or electrically. You can make 4 different types of cold desserts with this maker. You and your family can make gelato, sorbet, frozen yogurt or ice cream. It can hold 6 quarts of creamy goodness so everyone will get a bowl. The appliance itself is made from a hand-crafted solid pine material to form a wood bucket. There are only a couple of pieces to put together to make this super easy to use and clean. There is an aluminum freezing canister inside the wooden bucket that is extremely durable and heavy duty. It takes only 40 minutes of your time to make some of the best tasting and creamy ice cream you will every encounter. There is even an over-heat protection feature included with the motor. You won’t have to worry about “over doing it” if you are making enough ice cream for a large family. This ice cream maker is ideal for family get-togethers or picnics in the park. Do you find yourself constantly buying the pint size portion of ice cream at the grocery store? Now you can make your own ice cream in the comfort of your own home. Some people don’t like reading these ice cream maker reviews because they are meant for people who make a lot of ice cream at one time. 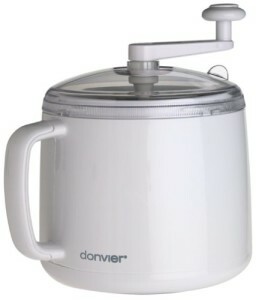 With the Dovier ice cream maker, you can make 1 quart at a time. This means you can make your own bowl of ice cream without having to put it in the freezer for later use. You don’t only have to make ice cream either with this item. You can make sorbet, frozen yogurt and even frozen drinks as well. Unlike some of the other older ice cream makers, you do not need any ice or salt. There is a freezer bowl and a paddle that do all of the work for you. The aluminum freezer bowl comes out of the appliance and can be cleaned quick and easily. This ice cream maker is cool because you use the handle to crank the cream into ice cream. You are essentially making your own ice cream by hand with the help of the freezer bowl. It is small in size only measuring 9.5 inches high and 8 inches in diameter. If you don’t know what kind of ice cream you want to start making, you can consult with the recipes that are included with this ice cream maker. All of the ice cream maker reviews focus on turning cream and fruit into sorbet and ice cream. This Yonanas is great for someone who is a health nut. You can turn any frozen fruit into a tasty and creamy frozen dessert. This machine acts like a juicer in a way. You feed the frozen fruits into a tube and it automatically turns them into a consistency equal to frozen yogurt or ice cream. You can put your frozen fruit along with other flavorings into the tube and out comes the perfect frozen treat. This will help you fulfill you sweet tooth cravings without including all of the calories and fat. The chute for the machine easily accepts sliced mango, berries, cantaloupe and frozen bananas. The bananas are important to include in order to get the silky-smooth consistency of frozen yogurt. If you don’t want to use bananas to make frozen yogurt, you can make a tropical sorbet using pineapple and mango and other various fruits. One of the best things about this ice cream maker is the accessories it comes with. 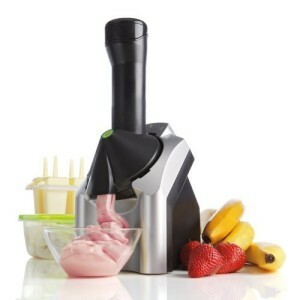 You will get a few different items when you purchase the Yonanas frozen treat maker. You will get a set of 4 Popsicle molds, a recipe book and even a dessert storage container. Everything is easy to clean and is dishwasher safe.